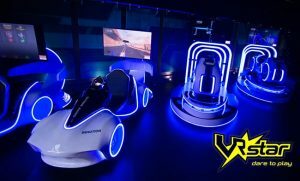 Tuesday 24 April 2018: VR Star, provider of the UK’s largest virtual reality (VR) experience centres, is set to launch five new outlets in Cardiff, Middlesbrough, Manchester Swindon and Wakefield over the coming months. The centres offer people the opportunity to experience a truly immersive VR experience, far beyond what is currently available in the home. VR Star is the retail brand of Immotion, the fast-growing Immersive Experience company. Operating the latest Immotion VR Cinema Pods, along with new cutting-edge content, VR Star is able to offer a truly unique VR experience, combing great graphics, sound and motion. More sites are planned to be launched over the coming months. The new centres follow the successful launch of VR Star in Bristol in December 2017 which has had nothing but five out of five reviews on TripAdvisor. As well as the VR Star centres, Immotion VR Cinema Pods have also been used by concession partner, Genting Resorts World. Its ‘Feed the Dinosaur’ VR experience features in Yorkshire Museum’s Jurassic World exhibition, the educational attraction that was opened by renowned naturalist and broadcaster Sir David Attenborough in March 2018. The BBC star described the technology as “tremendous”. More details can be found here. Immotion is currently working with a number of additional concession partners across Europe and US which it will announce shortly.